PT Bank BNI Syariah - BNI Syariah is one of the largest Islamic-based banking (sharia) companies which has branches spread all over Indonesia. 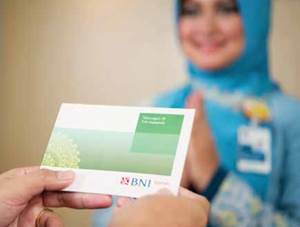 With services in all parts of Indonesia, BNI Syariah runs its business through 67 branches, 165 sub-branches, 17 cash offices, 8 functional offices, 22 mobile services vehicles, 20 payment points, 202 ATMs, and 1,500 outlets. Headquartered in Jakarta, PT Bank BNI Syariah is a subsidiary of PT Bank Negara Indonesia (Persero) Tbk (BNI Group), one of the largest state-owned financial group in Indonesia. At present, BNI Group is the majority shareholder at BNI Syariah with 99.9% of ownership. Other 0.1% remaining shares was owned by PT BNI Life Insurance. Started to establish since 2000, BNI Syariah was formerly known as Unit Usaha Syariah (UUS) or sharia banking business unit (SBU) of PT Bank Negara Indonesia (Persero) Tbk. Later in 2010, PT Bank BNI Syariah officially established as a spin off results of SBU BNI Group. In term of financial positions, BNI Syariah achieved positive financial performance In the first semester of 2015 (1H 2015, ended in 30 June 2015). BNI Syariah booked total net profit of Rp 99.94 billion in 1H 2015 or increased 50.33% as compared to Rp 66.48 billion in 1H 2014, according to BNI Syariah's Financial Statements June 2015 as cited by JobsCDC.com. BNI Syariah's total asset in 1H 2015 amounted to Rp 20.85 trillion, up by 20.24% compared to Rp 17.34 trillion in 1H 2014. Minimum Bachelor Degree (S1), preferably majoring in Finance Management, Economics, Statistics and Engineering. Minimum 1 year of experience in the field of strategic/finance/risk/treasury. Have a high willingness to work hard (all out). JobsCDC.com now available on android device. Download now on Google Play here. Please be aware of recruitment fraud. The entire stage of this selection process is free of charge. PT Bank BNI Syariah - Recruitment Risk Alma Officer BNI Syariah March 2016 will never ask for fees or upfront payments for any purposes during the recruitment process such as transportation and accommodation.